We’d love your help. Let us know what’s wrong with this preview of Peach and Blue by Sarah S. Kilborne. Illustrated in full color. He is a blue-bellied toad hopping aimlessly through life. She is a sad peach yearning for escape and adventure. Then one remarkable day, Peach and Blue explore the pond that Blue calls home and awaken each other to a world neither has ever really seen before. Lush illustrations by the award-winning illustrating team of The Salamander Room and Illustrated in full color. He is a blue-bellied toad hopping aimlessly through life. She is a sad peach yearning for escape and adventure. Then one remarkable day, Peach and Blue explore the pond that Blue calls home and awaken each other to a world neither has ever really seen before. Lush illustrations by the award-winning illustrating team of The Salamander Room and The Frog Prince, Continued perfectly complement this unique and graceful story. To ask other readers questions about Peach and Blue, please sign up. Usually I don't read the books we shelve on the library carts at Children's Hospital. But, when I saw Peach and Blue today I made an exception. This was, I guess you would call it a picture book, that my ex-wife would often read to our daughter (Willie and Hugh was another one that was both of their favorites). This simple story of a peach and toad is very touching. The pictures are well done, and I think any parent would enjoy reading this to their child. The messages are simple but I think univ Usually I don't read the books we shelve on the library carts at Children's Hospital. But, when I saw Peach and Blue today I made an exception. This was, I guess you would call it a picture book, that my ex-wife would often read to our daughter (Willie and Hugh was another one that was both of their favorites). This simple story of a peach and toad is very touching. The pictures are well done, and I think any parent would enjoy reading this to their child. The messages are simple but I think universal. That you don;t always see the beauty around you, and how important someone else can be to your life. And, for some of us, as melancholy as they might be as we get closer to Valentine's Day, good memories of a family being together. Which in part is what the ending of Peach and Blue is about. Being together for as long as you can. The story of an unlikely friendship between a peach and a frog, who learn to see the world through each others eyes and despite knowing that their time together is finite, choose to spend it well. 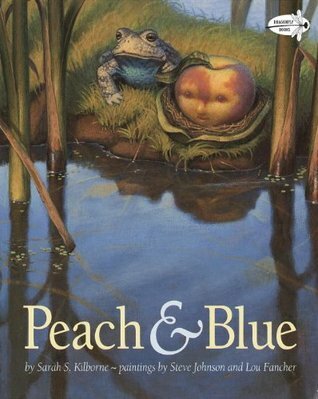 although the characterization is simple, the author makes us feel a genuine attachment to Blue and Peach. If I were reading this book in a classroom, I might use it to discuss the idea of multiple viewpoints, of people looking at things differently than others. 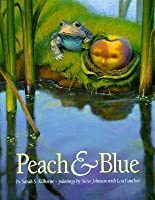 In the book, the frog, Blue, takes the pea The story of an unlikely friendship between a peach and a frog, who learn to see the world through each others eyes and despite knowing that their time together is finite, choose to spend it well. although the characterization is simple, the author makes us feel a genuine attachment to Blue and Peach.
" I wish I could stay here awhile." "you can stay here forever, if you like," said Blue. "I'd like you to." I don't think I'll last forever, " said Peach. That's okay," said Blue. "Not many folks do. But until then, you have me, and I have you." An adorable tale of two friends who would do anything for each other, and a sweet must-read. This was a very cute story but very interesting because the author made a peach come alive like a person and the peach made friends with a frog, so it was different but in the end had a good story behind it. Simply beautiful, this book brings tears to my eyes every time. A story of friendship and temporality. Peach and Blue bond knowing that Peaches can only live in trees and both lives are richer for her bravery. Peach and Blue is about a blue-bellied toad named Blue and a peach named Peach. One day, Blue wanted to take a walk, away from his pond. He wants to sit under the shade of a large peach tree sitting on a hill. As he sits he feels a rain drop but there are no clouds in sight. He looks up and sees a peach, her eyes shut, crying. Blue asks why she is crying and Peach says that she wants to see the world because someone will soon pick her because she is nice and ripe and she wants to see something Peach and Blue is about a blue-bellied toad named Blue and a peach named Peach. One day, Blue wanted to take a walk, away from his pond. He wants to sit under the shade of a large peach tree sitting on a hill. As he sits he feels a rain drop but there are no clouds in sight. He looks up and sees a peach, her eyes shut, crying. Blue asks why she is crying and Peach says that she wants to see the world because someone will soon pick her because she is nice and ripe and she wants to see something other than her tree, so Blue and his many brothers and sisters help to get her down. Blue shows her his world, his boring pond and Peach shows Blue everything through her eyes. All the different colors and sounds and most of all, Peach shows Blue about how wonderful and beautiful his pond and shows him the world through different eyes. I really like this book because it teaches about friendship and how if you look at things from a different point of view the world can be even more beautiful than you think it is and a dull, boring pond can be full of color and life. Peach is a peach and Blue is the toad. Peach lives in a tree and cried to Toad that she was sad because she wanted to see more before her time was up. Toad takes Peach off of the tree and places her in the basket. Toad and his family walk peach around and let her explore whatever she wants. Toad and Peach become good friends. This book is full of illustrations. This is a great book to show how giving details when writing a story can create a great story. This is truly a great book depicting love and friendship. This is my favorite children's book of all time as it shows, with beautiful illustrations, the power of giving, sharing, loving, and caring! Two separate entities giving of themselves, and not trying to take from the other...awe inspiring theme! This book showed an importance of friendship. Blue saw that Peach was unhappy and he did whatever he could to make her happy and help her experience the world around her. Peach was very thankful for Blue helping her see the world. It was what she wanted to do. Blue protected her and kept her company for a while. This beautiful picture book is about a toad who meets a peach that wants to see the world. Together, the take on several challenges and Peach is able to see wonderful sights that she would have never seen from her peach tree. Throughout the adventure, the two become great companions who clearly love each other very much. They take comfort in knowing that they have each other. Saw this book many years ago working in a bookstore, and snatched it up because of the beautiful illustrations, as well as the story. I was saving it for my children before I even met my husband! Wonderful story of friendship. Will have to buy it again, can't find my copy and I want my daughter to read it. This is one of my absolute favorite picture books. I've been reading it to my students for several years now and I get misty-eyed every time...never fails!! The pictures are lovely and I love the discussion I have with my students after we're done sharing it. I also love giving this book to friends and family. A wonderful addition to any collection. For kids in grades (2-4). I was reading this book to my daughter one night before bed, and I had to stop because I was so choked up. My husband thought I was nuts. The illustrations are so beautiful, especially the ones of Peach. Like you could almost reach out and touch her fuzzy cheek. So sweet and sad, but beautiful. This book shows that no matter how different you are or where you come from, you can develop a friendship with anyone if you are willing to help each other out. I think this book could be read to any age because everyone needs to be reminded about what a friendship actually is and not what kids can make of it. I think this book is about dying even though it never really says anything about death. It's about being in the moment and caring for the people around you. The illustrations are lovely and look like pastel but the cover says they were painted by a husband and wife team. I wonder how that works. Does one sketch and the other color it in? whatever the system, it produces nice results. A most unlikely friendship story, beautifully told and illustrated. A toad and a peach find each other as a summer draws to a close, and delight in the world around them, looking at the familiar with new eyes. A favorite! Of all the children's books I have read to my family this one will always be on our shelf and remain close to our hearts. The most endearing story of a frog and a peach has such a wonderful lesson for all children and adults. This is a very unusual story of the friendship between a peach and a toad, especially the idea of sticking with a friend no matter what, as the peach begins to rot (die) after falling from the tree. A nice book for a unit on diversity too. I love this book - the illustrations and the story. Peach longs to see the world and Blue, her toad friend, helps her to do that. They both learn from each other and though their time together is short - it is lovely. 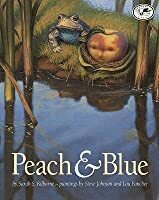 This book is one of my favorite books I love the friendship between peach and blue. Peach is a peach and she wants to see the world.Blue is a frog and he helps her to see the world.Blue shows her all of these she has never seen before. it is a really good book and a good book for children. I'm not an expert on children's books by any means, but I love this one. 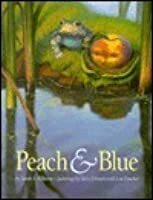 Charming and offbeat, it tales a tale of gentle acceptance and embrace after a peach tumbles out of its tree and lands next to the frog Blue. Peach and Blue is a delightful story about appreciating friendship, nature, and the present moment. I was drawn to the book's luminous illustrations.